You are viewing this Brand New Officially Licensed NFL Football Fan Apparel Item. 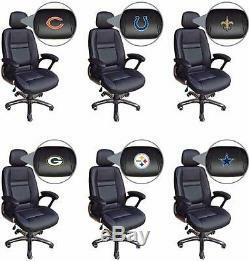 Choose Your NFL Football Team Head Coach Black Leather Executive Office Chair. Sit comfortably & show your Team Spirit with this high quality Leather Ergonomic High Back Office Chair with Embroidered Team Logo! Show some pride and support of your favorite NFL Football Team while at home, office, or in the dorm with this officially licensed Embroidered Black Leather Head Coach Executive Office Chair! Use drop-down box above to choose from the available Teams and view product image! This Leather "Head Coach" Executive Chair is an ergonomic modern style High Back Swivel & Rolling Office Chair made for maximum support and comfort. Whether you are working on your computer at home, office or in your dorm, you can express yourself with your favorite team or school spirit. Top Grain Black Leather upholstery with Contoured Lumbar Support Thick Padded Seat and Back for maximum comfort! Oversize Leather Headrest which is decorated with an officially licensed Embroidered Team Color Logo! Pneumatic seat-height adjustment lets you achieve the optimal seat position with just the touch of a lever. Tilt Tension Adjustment & Single Lever Seat Height Control with Locking Mechanism. Five Leg Heavy Duty Nylon Base with durable Dual Wheel Casters and Chrome Accents. Padded Nylon Arms with Leather Upholstery and Chrome Accents! It has all the ergonomic features you would expect from a high end chair. Styled and manufactured to replicate a high end sports car bucket seat. Ergonomic Leather Chair with a Contoured Seat and Seat Back with Tilt. Approximate size is 48 - 52'' Tall x 28'' Wide / 250 lbs Weight Capacity. Be the envy in the Office, Dorm, or neighborhood! A must have for any sports fan, student or alumni. Meets ANSI / BIFMA standards. Officially Licensed by the NFL. Product Size: Approx: 48 - 52'' Tall x 28'' Wide / 250 lbs Weight Capacity Product Color: Black & Team Colors Product Material: Leather, Nylon, Metal, & Foam. Tailgate Toss - The Original Bean Bag Toss game is the hottest outdoor game on the market with new products always being introduced. NFL SHOP AT LORRINA'S HOT DEALS. BEST PRICES ON THE NET - BLOW OUT SALE - WHOLESALE PRICING. Visit Our Other Store Items at Lorrina's Hot Deals. Please visit their website to read about important information regarding receiving package. You may or may not have to sign for your package. That is determined by the driver if they can leave it at your door or in a secure place. INTERNATIONAL BUYERS - PLEASE NOTE. Thank you for your time and business! When your replacement product(s) are reshipped to you, there is no extra cost to you and a return call tag label will be provided for returning the damaged or defective item. We want your shopping experience with us to be a "5 STAR" experience. Once your item(s) arrive, please make sure that your order is correct, intact, and complete. Upon doing this, you will also be able to rate on a scale of 1 - 5 in the four categories. We will make every effort to make your experience top notch! Powered by SixBit's eCommerce Solution. The item "Choose Your NFL Football Team Head Coach Black Leather Executive Office Chair" is in sale since Tuesday, January 06, 2015. This item is in the category "Sports Mem, Cards & Fan Shop\Fan Apparel & Souvenirs\Football-NFL". The seller is "lorrinashotdeals" and is located in Westfield, Indiana. This item can be shipped worldwide.